Scientific method is an organised and systematized or logical way of finding answers to questions or finding solutions to problems. One of the most important steps in scientific method is theorizing or formulating laws based on the experimental result. Both theory and law should be logical, rational, scientifically testable deduced with existing observation and experimental evidence. Valid scientific laws are more valuable than valid scientific theories. Let us start with examples for better understanding. Think of an example of theory or law while moving through each point. *An object at rest remains at rest unless acted upon by a force. An object in motion remains in motion, and at a constant velocity, unless acted upon by a force. Theories are explanations of a phenomenon. Theory explains how nature works. Law explains what is nature doing under certain conditions and it can predict the future if the conditions are satisfied. 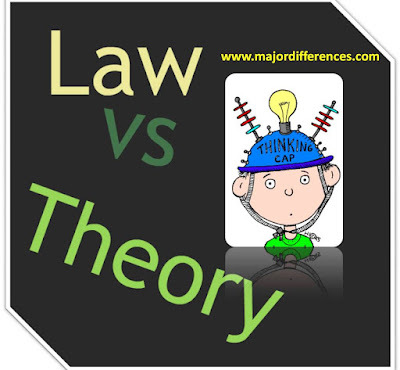 Theory is often descriptive and complex than laws with detailed explanation or contains several supported hypothesis. It is a concise summary of large number of facts. A theory might have exceptions. For example, take the case of cell theory, now we know sub cellular particles like viruses, viroids, prions etc showing some characteristics of life. A law has no exceptions when it is proposed or framed. Theories are subjected to revision and may be replaced or revised from time to time based on new findings. Example: Neo Darwinism revised Darwinism by addition of findings in genetics. Theory of spontaneous generation of life is rejected or disproved. The credibility or authenticity of theory depends on the amount of evidence that supports the theory. A law is an established universally observable solid fact. No further evidences are required to make it more authentic. Can you do 7 similarities between theory and law please?